Individuals who achieve Cloudera Certified Specialist in Apache HBase (CCSHB) accreditation have demonstrated their technical knowledge, skill, and ability working with Apache HBase. 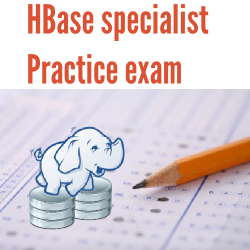 This course provides access to CCSHB practice exam for candidates to self-assess their exam-readiness against the full course of certification objectives focusing on Apache HBase. Rich pool of 60+ questions based on many interviews and authentic course-ware.